The peak is located at a crossroads of touristic routes. If federal authorities back up this initiative, it will be the first Russian mountain named after an Orthodox saint, the Pravoslaviye na Severnoy Zemle website has reported on Wednesday. The Rossiya Pravoslavnaya public movement and Bishop Pitirim of Syktyvkar and Vorkuta initiated naming the peak after Stephen of Perm. Earlier in his address to the State Council, Bishop Pitirim stressed that perpetuation of St. Stephen’s name would strengthen historic traditions that were being revived in Komi. Patriarch Alexy II blessed works on naming the peak in 2007. Orthodox believers organized an expedition three years ago and climbed the nameless peak to commemorate St. Stephen’s 610th anniversary. Bishop Pitirim blessed to set up a commemorative table with the saint’s name on the top. 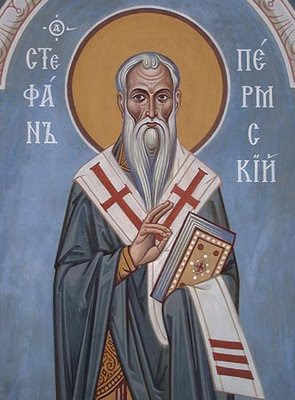 Our father among the saints Stephen of Perm was a fourteenth-century Russian missionary who is known as the Enlightener of Perm and Apostle to the Zyrians for bringing Orthodox Christianity to the Zyriane (Komi) people. To facilitate his missionary activities, he developed an alphabet for the Komi (Permic) language. St. Stephen’s feast day is April 26.